Pictures are worth a thousand words. 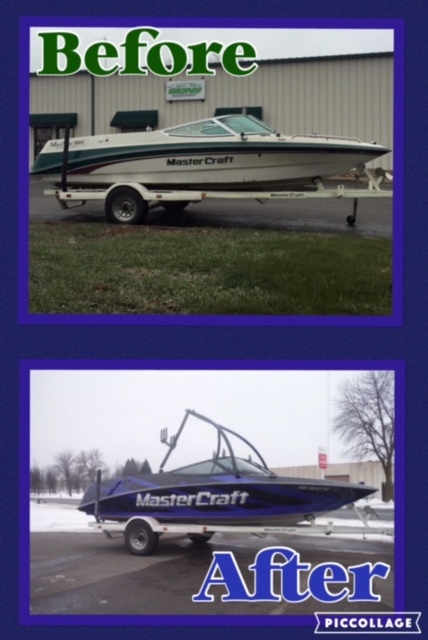 Check out this awesome transformation of this Mastercraft Maristar. The tower and the windshield frames were powder coated black, the windows were tinted. The interior vinyl was dyed black, the dash wrapped in carbon fiber. The owner is going to get new carpet and upholstery and this boat is going to look and feel like a new boat. With the rising boat prices this is a great investment when a boat is mechanically sound. It's Time to get your Boat Wrap on the Schedule!